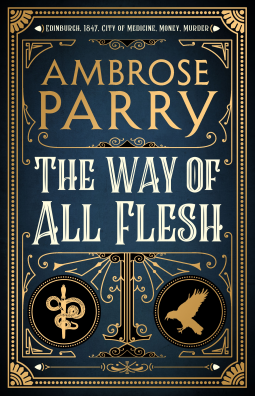 The Way of All Flesh is the debut novel from Ambrose Parry: co-written by best-selling crime writer Chris Brookmyre and consultant anaesthetist Dr Marisa Haetzman. I knew as soon as I began reading The Way of All Flesh that I was going to enjoy it – it’s historical crime fiction at its very best. Full of atmosphere and historical detail, I could easily believe I was there in Edinburgh in 1847 as Dr James Young Simpson, a professor of midwifery, discovered the anaesthetic properties of chloroform. It combines fact and fiction most successfully, the social scene, historical and medical facts slotting perfectly into the plot. It begins with the death of Evie, a prostitute in Edinburgh’s Old Town, found by Will Raven, a young medical student about to start his apprenticeship with Dr Simpson. Will, Evie’s friend is suspicious, the place was reeking of drink and Evie’s body was in a state of contortion. He flees the scene, not wanting to be implicated in her death. There is a mystery surrounding Will – he has a past that he wants to conceal, and he is in trouble with a couple of villains who beat him, slashing his face when he is unable to repay his debt to a moneylender. Will is anxious to fit in with the more genteel society of the New Town, where Dr Simpson has his surgery, a place where people from all levels of society congregated – the poor who attended his clinics, the wealthy who also wanted treatment, and the medical students and colleagues experimenting with new drugs and medical techniques. When Will comes across similar deaths during his work with Dr Simpson he is determined to find out who is responsible – was it the same person who had killed Evie? Sarah, Dr Simpson’s housemaid is an ambitious and enterprising young woman who would love to have a career in medicine just like the male medical students. Initially she dislikes Will, but eventually they join forces to uncover the killer in the depths of Edinburgh’s dark underworld . Through Sarah’s eyes we see the frustrations and limitations that all women experienced and through Will’s eyes we see the grim realities and danger that women at all levels of society faced with childbirth and unwanted pregnancies, and the brutally primitive state of the medicine of the period. The medical scenes are indeed gruesome and the attitudes of some of the clergy with their opposition to the use of anaesthetics is deplorable. The authors have combined their specialities to provide a compelling murder mystery interwoven with the exciting discovery of chloroform and how it transformed surgery. This is without doubt an impressive and well written book that gripped me throughout – definitely one of the best books that I’ve read so far this year. And I am so pleased that this is not the end of Will as Chris and his wife, Marisa are planning more novels revealing the development of medicine and the part that the Simpson household played. Also, I see that Benedict Cumberbatch’s SunnyMarch production company has secured the TV rights to The Way of All Flesh. Thank you to Canongate Books and NetGalley for my copy of this book for review.